A natural blend of Cocoa Seed butter, Coconut oil, Sweet Almond oil and Jojoba seed oil, with additional extracts of Calendula flower, Jasmine flower, Rose and Hibiscus flower, this product creates a gentle and unique Dual Phase body hydrating lotion to enhance skin moisture and health. 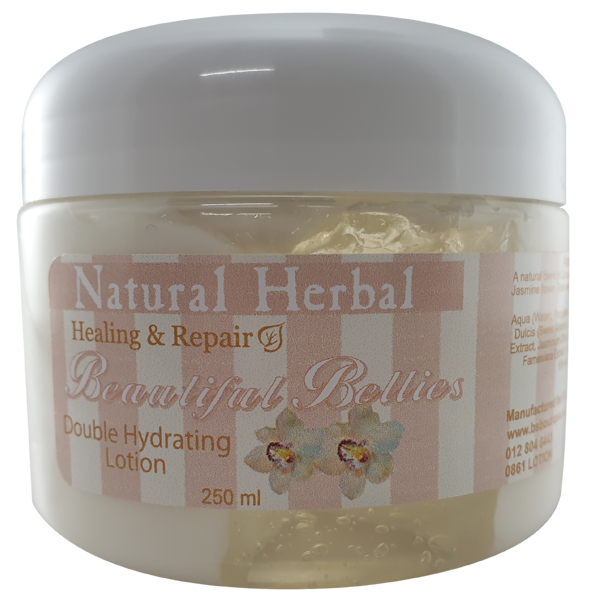 Healing & Repair Range Beautiful Bellies 2 Tone Lotion is packed with high intensity ingredients to deliver a deeply moistening lotion. Cocoa seed butter has been added as it is high in good fatty lipids for the skin, and it is known to help minimize the appearance of stretch marks sustained during pregnancy. The inclusion of Coconut oil enhances the moisturising properties of the product, and further reduces visible signs of skin stretching through keeping it flexible and supple. It is also known to poses anti-fungal and antibacterial properties contributing to the general health of the skin. Jasmine extract has a sweet soothing scent which helps with relaxation, while also keeping the skin moistened and healthy, with its non-irritating and non-sensitizing benefits. Rose flower extracts also soothes and relaxes the body and mind, while it is also known to sooth inflamed and red skin. Hibiscus flower extract is a natural source of alpha hydroxy and amino acids which help protect and keep the skin in a healthy and flexible condition.